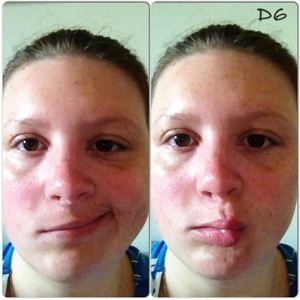 I have been taking daily photos since my Bells Palsy kicked off. So I could see if there was any change. I’m on Day 6 and there is no change at all. However, it hasn’t got any worse, thank god! I still slur my speech if I speak for any length of time and I get tired very quickly. I can’t pronounce words that contain B’s or P’s, which is frustrating. I can’t talk quickly, I have to speak slowly to form my words, which often makes me feel incredibly stupid. Yesterday I think I felt a small twitch on my right nostril, but I can’t be 100% sure if it was real or if I think it was because I wanted to be. However I’ve just felt it again, so I think it was real! I am still self conscious, despite The husband saying “despite your wonky face, I still love you” yesterday. Thankfully I have had no horrible experiences out in public. It’s just a waiting game now. How long before it starts to resolve? How long before I can eat and drink properly? How long before I can speak without sounding like I’m drunk? I’ll admit I am fed up of waiting. I want my face back, I want to feel better. I have a review with the GP next Wednesday. My medication will be completed and hopefully something will have started to change. If there has been no change at all, then I guess the GP will decide what else we do and when next we review. At that moment Emma did the biggest smile. 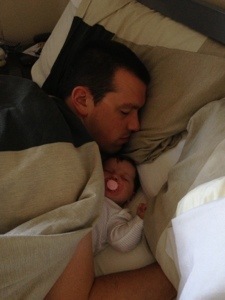 She’s going to have daddy wrapped around her tiny finger I think. The Husband has a fascination with space exploration and the universe. 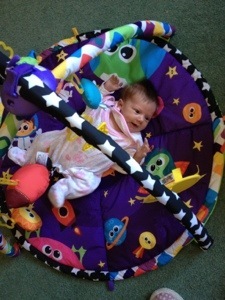 When Emma grows up she’s going to be a space explorer. 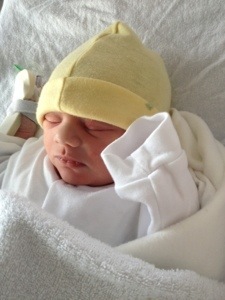 The Husband and I are so incredibly pleased to announce the safe arrival of our beautiful daughter Emma Kate aka Flump. 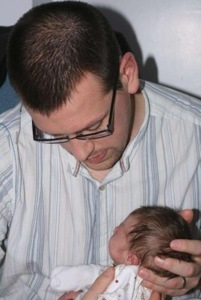 After 22 hours of labour (or thereabouts) she was born on March 27th 2013 at 02:59 weighing a grand total of 6lbs and 9ozs. We are truly besotted with our beautiful baby girl. I’m still trying to get my head round the fact that I’m carrying a baby. It’s a very surreal experience that every so often throws me into a wobble. A magical surreal experience, with genuine Oh My God moments. Flump is due today, however only 5% of babies come on their due dates. When I found out I was pregnant on July 13th 2012, the first thing I did was tell The Husband and then I went on to the Internet and calculate my due date. The internets informed me 22nd March. On July 18th we saw our doctor, who double checked, yep, still the 22nd of March. We waited (impatiently) for our first ultrasound scan on September 16th and again was confirmed as an expected due date of 22nd March. From the moment I saw/heard the 22nd March I automatically knew I wouldn’t be on time and instead instinct told me I’d go 2 days overdue. Flump would arrive on March 24th, which is my own birthday. Just like instinct is telling me that Flump is a boy. It seems we only have a few more days to find out! Today was potentially my last midwife appointment. It was rough and brutal. After all the checks were done, I had an internal examination, cheerfully known as a “stretch and sweep”. Does what it says on the tin people. Stretches and sweeps your cervix to get those hormones that trigger your labour to flow freely. The midwife was surprised, as most first time mums aren’t quite ready on their due dates. They have firm and unyielding cervixes. Mine? Well it’s soft and thin and stretching quite nicely. Hell, you could buy it dinner and drinks and it would probably let you take it home on the first date! Its basically doing what it should, 1cm down and only 9cm to go. The midwife also managed to get a feel of Flumps head. She double checked babies heart rate afterwards, and it was a bit higher, poor little bugger was probably freaked out that someone had touched his head! Flump hates been palpated during appointments so god forbid his reaction with someone physically touching his head. Surprised I didn’t get a few broken ribs. My next appointment is the 28th, however midwife doesn’t think ill be attending that appointment, so we should have an actual baby soon!! I took a bump photo today. The plan with all of the bump photos, scan photos, photos of us prepping for Flump will eventually be made into a book, along with a few of the posts I’ve written here whilst pregnant. I think it’s a lovely idea of something Flump can look at as he/she grows older and will be a great keepsake along with the baby book that The Husband and I are putting together. 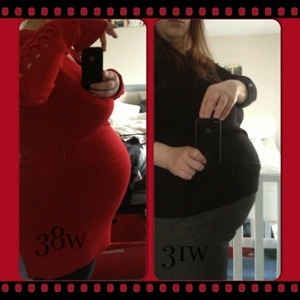 After I took my 38 week bump photo, I compared it to one 7 weeks ago when I was 31 weeks. 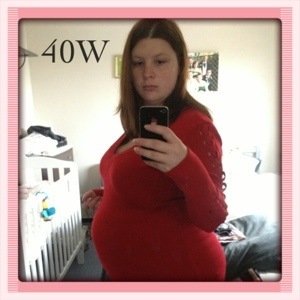 It’s scary that I look ever so slightly smaller this week than I did 7 weeks ago! Granted I’ve lost a bit more weight since, a grand total of about 17lbs has been lost since I became pregnant. Seriously, had I know I’d have lost weight whilst pregnant, I’d have done it years ago!! A few of my pregnant buddies have said that I look as though baby has dropped slightly. Dr Google and his Cronies said that towards the end you start to lose a bit of amniotic fluid and your baby bump does appear smaller. Who knows what it is, but all sources point to, baby will soon be here! We’re practically ready, although we still need to buy the cot mattress and bedding, yeah procrastinating at its best! We have pretty much everything else we need though. The plan once Flump arrives is to breastfeed. The plan has always been to breastfeed and express my breast milk so The Husband can help with feeds. 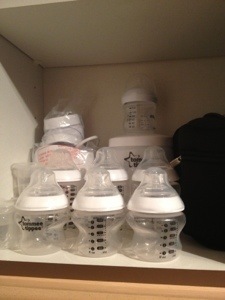 With that in mind my mother got us a bottle and sterilising kit by Tommee Tippee. It comes with an electric steriliser, a single bottle microwave steriliser, an electric bottle warmer, 2 bottle insulators, formula mixers (??) a bottle brush, tongs, a dummy (soother) and 8 bottles. Tonight we set it all up. It looks pretty awesome, if a little overwhelming. With only 4 weeks to go (maybe less, maybe more) I’m finding myself very impatient. Not only am I achey and sore and so full of hormones that I could probably siphon off and donate some, but I’m also starting to experience that Pre-labour stage. Lots of cramping and full aches that feel like Aunt Flo is on her way to visit. Constant bathroom trips, plus other delightful signs. Right towards the beginning of my pregnancy I wrote this post and it got me thinking about all the things I’m impatient for. I’m impatient to see Flump and not be pregnant anymore. I’m impatient for cuddles and kisses and to experience the first emotions that you get when you give birth. I’m impatient to see what my baby looks like and sounds like. I’m impatient for Sunday mornings, with the Husband, snuggled in bed with Flump. I’m impatient to see that first smile, and I don’t even care if its wind. I’m impatient to see the Husbands first moment with Flump, to see Flump snuggled up with his/her daddy. Seeing Flumps face at yesterday’s growth scan and the fact that Flump has chubby cheeks has made my impatience grow by 100%. I can’t wait for that first skin to skin moment, that first cuddle, first kiss, the first time my baby looks at me and wonders “what the hell just happened”. I can’t wait for the first time I see the Husband and Flump together, two of my most cherished people snuggled up. I can’t wait to see Flump snuggled against daddy in our bed. So please don’t keep me waiting too long Flump, I’m impatient to meet you.